With colorful, striking images and words, THIS IS THE DREAM tells the story of the Civil Rights Movement and the power of nonviolent change that moved America from a country of enforced segregation to integration. In simple yet powerful words and rhyme, THIS IS THE DREAM is an excellent resource for teaching this period of history to younger children. Beginning with a quote from Martin Luther King. Jr., THIS IS THE DREAM details the atmosphere and historic events of the Civil Rights Movement from the segregated water fountains, buses, libraries and classrooms to those courageous acts of the school children entering a non-segregated school, the acts of resistance at lunch counters and on buses, and the marches against segregation. THIS IS THE DREAM concludes with a patriotic look at the results of the Civil Rights Movement in making America a land for all where all citizens can participate together. Both images and words present themes of courage and non-violence, even in the face of discrimination. Collages, often photographic montages, from actual real historical moments headline each individual illustration. Vibrant, patriotic and powerful, the imagery of each illustration conveys the story of the Civil Rights Movement in a way only imagery can. One sees the disparity and inequality in the two classrooms under the separate but equal doctrine. One feels the courage of the school children who first attended an integrated school under armed guard. In one illustration, a white man is part of the resistance at a lunch counter. Towards the end, one feels the courtesy of waiting in line and the joy of friendship across racial barriars in an integrated America. Because the images are so very powerful, the use of the Confederate flag in two of the illustrations in this short book seemed a bit odd given the overall message of the book. Yes, the Confederate flag is a symbol of the South, and the South was key in both some of the worst civil rights abuses as well as the key civil rights successes. THIS IS THE DREAM simplifies the story of Civil Rights without lessening the power of the story. For this very reason, I find the use of the Confederate flag slightly troubling. While historically accurate in many ways, its use also limits the need for and power of the Civil Rights movement to one region of the country when, in fact, racism affected the whole country during this time period. The Civil Rights Movement was not just a movement which changed the South but rather all of America as authors and illustrator are so careful to show at the end. This one tiny observation does not negate the beauty of this book. I have, therefore, given a high number rating to the book. Perhaps as someone who had family in both North and South during this time, I am more keyed to notice regional portrayals and stereotypes particularly during the this time of history. Perhaps the use of the Confederate flag as well as the white activist sitting at the lunch counter would be the starting point for stimulating discussion about the scope of the historic movement and stereotypes in general ? THIS IS THE DREAM would be an wonderful resource for discussion in the class or outside. 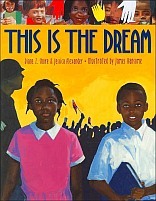 THIS IS THE DREAM is an excellent resource for teaching the Civil Rights Movement to young children. Both images and words boil down the key messages into easily understandable yet strong values. THIS IS THE DREAM is a book that will leave readers with a feeling of the strength of possibility. THIS IS THE DREAM teaches history not by shaming but rather by leaving its audience with a sense of hope, pride and patriotism. The writer and illustrator both reach the intellect and heart of their readers by highlighting the American core values of justness and fairness. An excellent resource for teaching American history to young children! Very highly recommended!